Come see our special shape balloons! During the day, visit our famous craft fair and enjoy some of the best live music in the region! For all you hot air ballooning fans, a world record for the highest manned flight was set on Sunday, Oct. 14, 2012, when Felix Baumgartner, 43, of Austria took his ultralight balloon to the edge of space at more than 24,000 feet. From more than three times the average altitude jets cruise, he freefell to Earth before landing safely near Roswell, New Mexico. Your local guide to the Atlantic International Balloon Fiesta! Paid hot air balloon rides available when weather conditions and other factors allow. The price is $200 per person, cash only. One Canadian dollar is approximately 0.75 Euros and equal to $1.20 U.S.. There are an average 50 flight spots available per launch. Come dressed in long pants and sturdy shoes if you hope to be one of the lucky passengers. Temperatures can be cool while flying, and landings can occasionally be in rough spots so be ready for some hiking. You must be at the flight launch field gate by 6:15 a.m. for the 6:30 a.m. morning flights, and be listening for your name to be called. Visitors who have booked on a cancelled flight will be reimbursed, and can be put on a waiting list for a future flight. The colours of a New Brunswick autumn are rivaled by the 30 hot air balloons that take to the skies over Sussex on the weekend following Labour Day. You're invited to join in this international celebration of gliding over some of Canada's most picturesque countryside. People have been enjoying hot air balloon flights since the first one launched in Paris, France, in November, 1783. The instantly recognizable round balloons are an average three houses tall, while the specially shaped ones can be much larger. The colours and designs range as far as the eye or imagination can see. Hot air balloons require nearly perfectly still air conditions to launch safely. While our valley provides near ideal conditions for flying, Mother Nature has a large say in whether the balloons go up on a particular day. Dress warmly if you attend the morning launches. While many balloon launches take place from Princess Louise Park, prevailing winds will sometimes prompt the pilots to start from a neighbouring property. Event organizers post regular updates on the location of these launches, so check in before heading out. Convenient off-street parking surrounds three sides of Princess Louise Park, just a five to 15-minute walk away from the centre of activities. Some parking lots are operated as fundraisers for Sussex area non-profit groups (average fee is $5 per vehicle per day), while others are available free of charge. Admission to most fiesta events is absolutely free! Sussex is in south central New Brunswick, approximately an hour away from the cities of Moncton, Saint John and the New Brunswick capital, Fredericton. From the west, take the TransCanada Highway to Exit 365 before following Route 10 to Sussex. From the east, you have the option to also follow the TransCanada Highway to Exit 365 and on to Route 10, or you can take Route 1, and take either exit 198 (Sussex Corner) or 195 (Four Corners -- look for the red Frenchy's building or the big Holstein cows) into town. From Maine, cross into Canada at St. Stephen/Calais before following Highway 1 (MacKay Highway) two hours to Sussex at Exit 192. Learn about road construction projects on your route. If you have a camper and are one of the lucky ones to get a parking spot close to the Princess Louise Park, make sure your vehicle is self-contained. The three temporary parking lots that allow overnight stays ($15 for RVs at the armouries, $50 for the weekend at the Eveleigh Street parking with a prime view of the launch site and on Marble Street) do not offer electricity, sewer or other supporting services. There is no public parking or camping on the venue grounds. However, the many campgrounds on the outskirts of town are more than pleased to welcome camp trailers and tenters alike. If a family member must reach you in case of an emergency, the Sussex RCMP detachment may be reached at 433-7700 during office hours. The New Brunswick RCMP Tourist Alert can also be contacted toll free at 1-800-665-6663. In case of accidents, fire or other emergencies while visiting New Brunswick, call 911. For the comfort and safety of both visitors and pets, please leave your pets at home. The public is allowed to ONLY bring service dogs for the disabled on to the grounds. The footing in Princess Louise Park is mostly dirt, grass and gravel. Bring wagons, children's strollers or wheelchairs with wider tires to make navigating the occasionally uneven ground easier. Town crews do a great job maintaining the park, yet thousands of visitors over the three days can create rough going in places. While few special parking spaces are set aside for seniors or the disabled, parking lot operators will often do their best to accommodate your needs. Public parking is not permitted at the sports centre that weekend. Also, no bicycles are allowed on the grounds. Visitors who use motorized wheelchairs or scooters may wish to park for the day in the paved lot at Mrs. Dunster's Donuts (corner of Eveleigh Avenue and Leonard Drive) or the Sussex Armoury (Leonard Drive, opposite the main Princess Louise Park entrance) are good choices, with easy access to sidewalks. A limited number of spots are available here and fill very quickly. A good third choice is the Sussex High School, also on Leonard Drive, which has a large paved parking lot a 10-minute walk from the flea market venue. Your fourth choice might be O'Connell Park, on the corner of Leonard Drive and Main Street, with its flat gravel parking. Next to the park, connected by a wooden walking bridge, the paved parking lot of the neighbouring Fundy Model Forest offices on Magnolia Avenue, is a popular parking place, as well. The public is allowed to ONLY bring service dogs for the disabled on to the grounds. 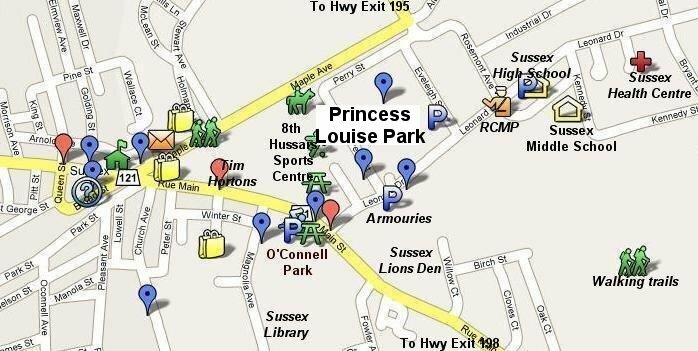 The fastest way to reach Princess Louise Park is from either Highway Exit 195 (Four Corners -- look for the red Frenchy's building or the big Holstein cows) or Exit 198 (Sussex Corner). * Sussex Train Station on Broad Street, downtown Sussex. There is plenty of convenient off-street parking on three sides of Princess Louise Park, just five to 15 minutes' walk away. However, these lots fill very quickly, so you're strongly encouraged to both carpool where possible and arrive early. Some parking lots are operated as fundraisers for Sussex area non-profit groups (average rate $5 per day), while others are available free of charge. One of the most popular parking spaces is the armouries, across the road from Princess Louise Park. Another site on Eveleigh Street offers RV parking for the weekend for $50. There are several entrance points to Princess Louise Park over the weekend. While few special parking spaces are set aside for seniors or the disabled, parking lot operators will often do their best to accommodate your needs. Public parking is not permitted at the sports centre that weekend. Also, no bicycles are allowed on the grounds. Paved parking at Mrs. Dunster's Donuts (corner of Eveleigh Avenue and Leonard Drive) or the Sussex Armoury (Leonard Drive, opposite the main Princess Louise Park entrance) are good choices, with easy access to sidewalks. Sussex High School, a further five-minute walk away along Leonard Drive, is another solid option. If you are hoping to make a weekend of it, the Sussex area has a variety of accommodation options, with motels and campgrounds just minutes from the Princess Louise Park. There are more than 200 motel rooms, campground and bed and breakfast operations in the Sussex area. You are strongly urged to book your spaces early, even up to a year in advance, to ensure your spot. 5. a good pair of walking shoes. 1. your camera, with fresh batteries! Note: Weather conditions on Fiesta weekend can range from blazing hot temperatures in the 30s to rains that turn the grounds into a muddy mess. 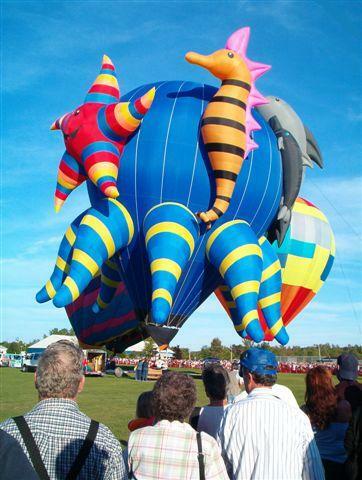 Serious balloon watchers are urged to come prepared for either. Dress in layers for the morning launches, as it can quickly change from cool to very warm after the sun rises. Check the weather in Sussex here to be best prepared when you arrive. Carpool where possible when visiting with a group. And be sure to arrange a meeting place and time should you get separated. The town quadruples in size that weekend, and it's easy to lose your friends in the crowd. Agreeing to meet at the sports centre entrance at 4 pm, for instance, can save a lot of worry on all sides. There is NO SMOKING around the balloons. A spark can quickly ignite the highly flammable fuel. Please enjoy your cigarette far away from the flight field. One of the most fun parts of Saturday afternoon is when some of the pilots invite the public to have a closer look at their ballooning equipment. This is one of the rare times the public is invited onto the flight field. Otherwise, please respect the boundary ropes and give the pilots plenty of room to inflate their envelopes and launch. Flights cost $200 per person (cash only please)...There will be a signup sheet at the information booth (aka the Seniors Centre -- the beige building with the porch in the middle of Princess Louise Park). You must tell your approximate weight. Please indicate if you are flying together. There are approximately 50 paid rides available per flight. While pilots have the final say on who flies in their vehicle, passengers must be an average 8 years old or older to participate. The Seniors Centre, (the beige building with the porch in the middle of Princess Louise Park), is the main information centre of the event. Visitors are encouraged to check in about lost or found items or missing members of your party there. Ensure any children in your group have identification. If a family member is trying to reach you in case of an emergency, the Sussex RCMP detachment may be reached at 433-7700. In case of accidents, fire or other emergencies, call 911. There are plenty of other fun things to do in Sussex after you have finished shopping for the day. Take in a movie at the Sussex Drive-In, view our 26 murals in our stunning outdoor art gallery or explore the 16 covered bridges in Kings County, eight of which are within a 15 minute drive of town. Can't make it to the Fiesta? Balloonport in Sussex offers hot air balloon rides year round. Visit www.balloonport.ca or call (506) 435-3245 to learn more!